Do you need a cow to make milk? Or can it come from a plant? Say an almond? Or a coconut? Or a hemp seed? This isn’t an academic question or a debate about foodie semantics but the heart of a food fight heating up in Congress over what can legally be called “milk” and whether it has to come from a mammal or can originate with a bean, nut or seed. The fight pits dairy farmers against soymilk makers and recently attracted Sen. Angus King. Jeff Wolovitz, who owns Heiwa Soy Beanery in Rockport, was surprised to hear King characterize the use of the word “soymilk” on his bottled product as an insult to farmers. Soymilk is mentioned in Chinese texts going back 2,000 years. Portland nut milk maker Myranda McGowan disagrees with the bill’s assertion that she is mislabeling her products and misleading consumers. She owns The Whole Almond located at the Fork Food Lab in Bayside and said the words “almond milk” and “cashew milk” on her labels tell her customers at farmers markets and co-ops exactly what they are buying. She said using the word “milk” modified by the name of the nut it’s made from is the clearest way to identify her product. Any other description, she said, would be less accurate and potentially confusing. Michele Simon heads the Plant Based Foods Association headquartered in San Francisco and represents the largest plant-based food manufacturers in Congress. She agrees with McGowan that dairy terms belong on plant-based products to ensure accuracy and transparency. But the bill is proving controversial even among its official supporters, since these days some dairy companies also sell plant-based milks. This debate about labels reminds me of the 2015 dust-up at the FDA over Hampton Creek’s vegan Just Mayo using the word “mayo” although it doesn’t contain eggs as FDA definitions require. Ultimately, the FDA allowed the Just Mayo name to stand. I’ve been unable to find non-dairy milks labeled as “milk” without a modifier (oat, hazelnut, flax) or a play on words. For instance, Blake Orchard on Exchange Street in the Old Port makes Mylk, supermarket brand Forager sells a Cashewgurt, and the former Elmhurst Dairy in New York (which recently switched from bottling cow’s milk to milking nuts) rebranded and now calls its minimally processed beverages Milked. 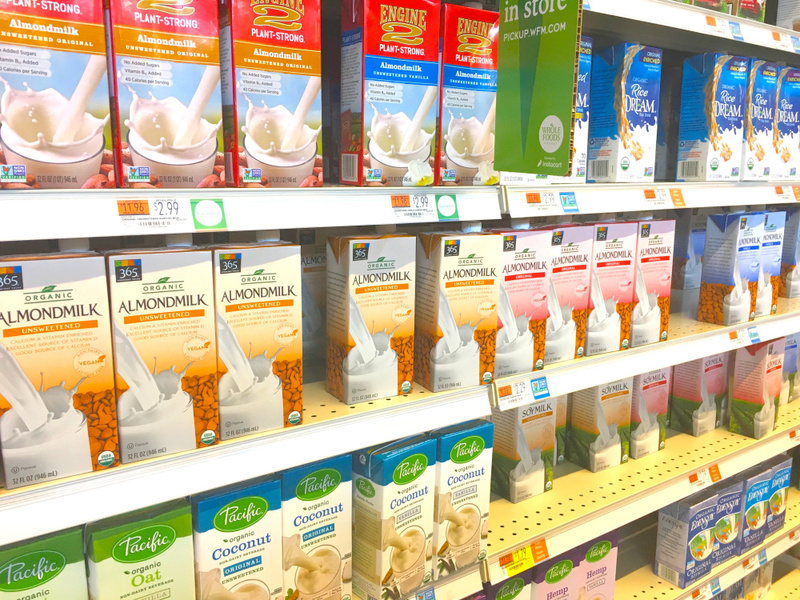 The story of Elmhurst is the story of the modern dairy industry: Cow’s milk sales are slipping (in Elmhurst’s case into unprofitable territory) while sales of almond milk and other plant-based alternatives soar. In fact, much of the reporting on the Dairy Pride Act by the New York Times, Forbes and others has focused on the public’s fading interest in cow’s milk while plant-based milks go mainstream. And suddenly it hits me. The real issue at the heart of the Dairy Pride bill is not mislabeling or misleading consumers but, as the title clearly states, pride. Or, more precisely, wounded pride. The dairy industry was once a pillar of the U.S. Department of Agriculture’s “Basic Four” food groups and as American as mom and her apple pie. But these days dairy is reduced to a fifth of the USDA’s MyPlate (forced to shared the shrunken space with Dairy Pride nemesis soymilk). And fewer moms bake pies. And some of the moms who still make pies serve them with a side of pea protein milk. This is not your grandma’s kitchen. As the granddaughter of a proud Maine dairyman, I can see how such cleverly worded quips would grate on a hardworking farmer’s nerves, particularly in the face of financial hardship. Yet despite the hurt feelings, no matter what Congress does this issue is unlikely to go away. In two recent rulings in California, the courts have sided with almond milk makers over the dairy industry, stating that modifying milk with the word “almond” makes it abundantly clear what is – and isn’t – being sold. Which leaves me wondering: Do either Congress or the courts have the power to change (or even slow down) consumer trends in the dairy case? So there you have it. Even Sen. King drinks plant-based milks. This leads me to only one conclusion: the Maine Animal Coalition has it right. We don’t need the Dairy Pride Act. What we need is a bill that offers grants to transition dairy farmers to soybean, oat or hemp farming and milk-processing plants to plant-based milk manufacturers. Congress can call it the Plant Pride Act. I’ll call it a win-win.